Everyone knows that cocoa butter is great for the skin. However, with such a distinct smell if you don’t care for it, it’s hard to ignore. 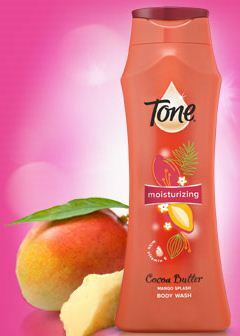 Tone’s Moisturizing Cocoa Butter Body Wash is infused with mango, papaya, and Vitamin E, so it has a pleasant, fruity fragrance. We recommend this for people who don’t like the smell of cocoa butter but want its benefits. This body wash has a thick consistency, but it’s not quite as creamy as some moisturizing body washes such as Dove Nutrium. It lathers and rinses well and it doesn’t leave your skin dry at all. However, if you’re skin is extremely dry you may want a richer body wash. Tip: Want to make a homemade body scrub? Try using 1 cup of full fat plain yogurt, ½ a cucumber, and 2 tablespoons of sea salt. Rub the mixture on dry skin before your shower to soothe and exfoliate at the same time!